Nobel Laureate William Faulkner lived on the ground floor in 1925, and sub-leased the ground floor from William Spratling, the famous artist, jewelry designer, and architect, who leased the whole house from a Creole family. While living on Pirate’s Alley, Faulkner and Spratling produced a book satirizing their friends, Sherwood Anderson and Other Famous Creoles. He also ate here, drank here, partied here, fell in love on the balcony here, wrote letters from here, gathered inspiration here and, most importantly, became a novelist here. 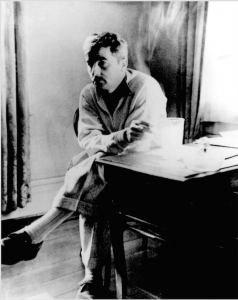 Faulkner arrived in New Orleans as an unsung poet, and by the time he left for France a year later, he was well on his way to becoming America’s most famous novelist. He had written and published his first novel, Soldiers’ Pay, within a year of arriving, and had gained inspiration for Mosquitoes, The Wild Palms, and Pylon. To support himself, he wrote a series of poetic sketches about New Orleans, which would later be compiled into a collection, New Orleans Sketches. Faulkner’s first work was published by a New Orleans journal, The Double Dealer,founded by a group of talented New Orleans poets in response to H. L. Mencken’s description of New Orleans as a cultural wasteland. The journal was active for several years, and also published the early work of Hemingway, Dos Passos, and Sherwood Anderson, as well as other writers who went on to become famous. Mencken ate his words and became one of the most ardent supporters of the journal. Today, Faulkner’s ground floor room is occupied by Faulkner House Books, owned and operated by attorney Joseph J. DeSalvo. The bookshop is a sanctuary for fine literature and rare editions, including works of and about Mr. Faulkner. Described by both collectors and writers as America’s most charming bookstore, visitors find the staff knowledgeable, helpful and hospitable. Please stop in on your next visit to the French Quarter. The shop is located in the city’s most historic neighborhood, just off of Jackson Square, behind the Cabildo and opposite St. Louis Cathedral’s rear garden. You can follow the shop on Facebook, Tumblr and Twitter, and see some of the rare editions on Etsy. Although the Faulkner House is primarily a private residence, arrangements to see it can be made by calling Rosemary James at (504) 586-1609. The owners require advance arrangements and a tax deductible donation to The Pirate’s Alley Faulkner Society, Inc. The owners allow third party groups to use the residence by special arrangement for social events in return for donations to The Faulkner Society. Biographers are certain that New Orleans provided the necessary catalyst to propel Mr. Faulkner into his destiny as winner of the Nobel Prize for literature. He is the Society’s namesake because he is an integral part of the literary heritage of New Orleans and the South and because he is generally considered to be America’s most important novelist of the 20th century. The Society was conceived in 1990 by Faulkner scholar W. Kenneth Holditch with designer and author Rosemary James and attorney Joseph J. DeSalvo, Jr. James and DeSalvo restored Faulkner House at 624 Pirate’s Alley, making it their residence, as well as DeSalvo’s book store for rare editions and fine literature. The Society was created as a salute to Mr. Faulkner, certainly, but also to all good writers, the men and women who provide us with the finest possible role models for encouraging young people to discover for themselves the rewards of reading and writing well. The Society’s most ambitious annual projects are: The William Faulkner – William Wisdom Creative Writing Competition, open to all writing in English anywhere, andWords & Music, a Literary Feast in New Orleans, five days of high quality literary programming for readers and writers. The current chairman of the Executive Board is business woman and volunteer activist Anne Simms Pincus; Treasurer is Rosemary James; Secretary is Scott R. Simmons; Vice President is Joseph DeSalvo. Chair of the Advisory Council is volunteer activist Sandra Trout Wilson, who is joined on the Council by her husband, attorney Louis Wilson. Northshore Chair is author Pamela Binnings Ewen (Mrs. James C. Lott); Mississippi Chair is Elizabeth Simms Hise. Honorary Chairman ofWords & Music, 2010 was board member Judith “Jude” Swenson, who was chairman of our annual fundrasier, Juleps in June, in 2009 and fundraising chairman for the Faulkner – Wisdom Competition in 2011. The Society is multicultural in membership and project goals. Members include men and women of all ages. The Society is operated primarily by volunteers with public and private cash donations in support of the Society and its projects, along with support in the form of contributions of goods, services, professional creativity and time. Events are open to all on an equal basis and are advertised as such. Interns are selected on a competitive, merit basis. Our established policy is one of reaching out, targeting promotion efforts to ensure equal opportunity of access to membership and programs. Our organization is 22 years old and meets all of the goals established in its mission statement, is increasing its membership and revenues, and is in the process of planning a long-term future for the Society. To join the Society, click here!